This document is a Presidential pardon issued by President Andrew Johnson. 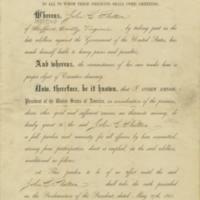 It was signed on July 5, 1866 by both President Johnson and Secretary of State William H. Seward. The year before, President Johnson had issued a proclamation on May 29, 1865, extending amnesty to most former Confederate soldiers. Despite the term "amnesty", the move was somewhat punitive on Johnson's part. He wanted to allow the larger portions of the Confederate Army to receive amnesty while punishing those who played a more important and visible role in the Confederacy. If they qualified the soldier had to swear a loyalty oath to the United States and free any slaves that he owned. Not all soldiers qualified under this amnesty, as it excluded fourteen "classes" of individuals. The reasons for the exclusion varied and a soldier could be disqualified if they served as a Confederate officer and were educated at the United States Military Academy or Naval Academy. Excluded soldiers could still seek amnesty, but would have to file a petition with the President. John C. Shelton was a minor figure who was excluded from amnesty but filed a successful petition. Three years later on Christmas Day 1868 President Johnson granted amnesty to all those former Confederates who did qualify under previous proclamations and who did not receive a formal pardon. 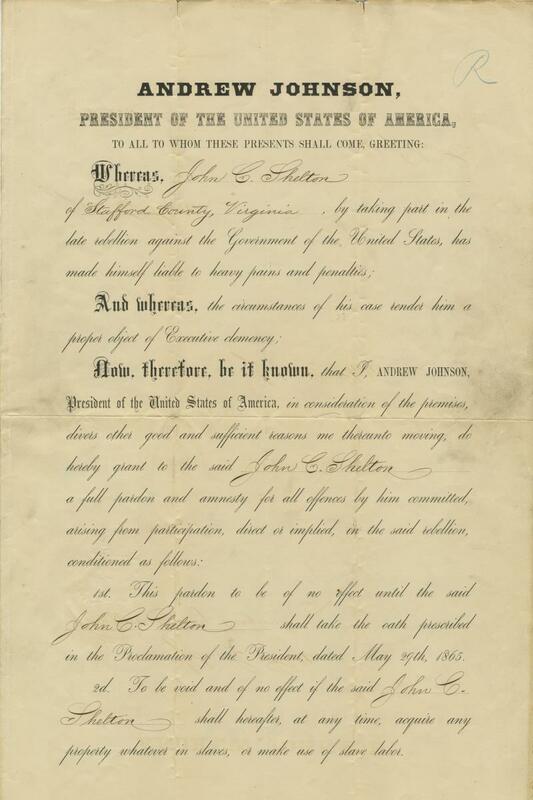 Citation: Presidential pardon for John Shelton, July 5, 1866, Accession 24593, Shelton Family Papers, The Library of Virginia, Richmond, Virginia. Analyze: What was the purpose of pardons like these? What did President Johnson hope to gain? 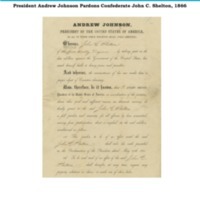 “President Andrew Johnson Pardons Confederate John C. Shelton, 1866,” Document Bank of Virginia, accessed April 21, 2019, http://edu.lva.virginia.gov/dbva/items/show/149.